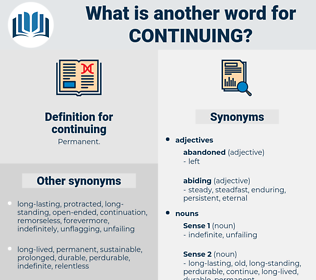 What is another word for continuing? ongoing, uninterrupted, unceasing, unremitting, lingering, relentless, unfailing, continuous, unwavering, ceaseless, unflagging, ever-present, long-standing, continuity, steadfast, long-lasting, around-the-clock, persistence, sustained, unabated, abiding, never-ending, contiguous, longstanding, repeated, untiring, perennial, pursued, running, unflinching, unstinting, unbroken, Maintaining. ongoing, pollutants, ministers, developments, Classes, POPS, Les, Its, constants, continuous, on-going, continuity, persistence, sustained, Sustaining, Maintaining. prosecutions, pursuits, exchanges, Efforts, Charges, prosecutors. ongoing, continuous, continuity, proceeding, persistence, abiding, Maintaining. Persisted, Remained, Prosecuted, retained, Sued, needed, spoke, expressed, ongoing, sustained, pursued. Furthering, persisting, completing, conducting, ensuing, Ceasing, Perpetuating, subsistence, Prosecuting, implementing, Consisting, Suing, Indicating, functioning, participating, Interrupting, supporting, counting, confirming, endeavouring, conserving, undertaking, insisting, inherit, Prolonging, reaffirming, relaunching, renewing, updating, Progressing, Combating, Receiving, e, beginning, insert, investigating, escalating, Guaranteeing, Nurturing, refining, Occurring, expanding, Undergoing, using, advancing, Extending, Carrying, recording, Promoting, Enhancing, mounting, practicing, pushing, budget, operating, engaging, supervising, welcoming, attending, developing, becoming, Stepping, improving, lengthening, less, seeking, unfolding, imposing, leaving, financing, Celebrating, Residing, Attaining, monitoring, Deploying, spending, Fulfilling, trunking, launching, framework, Addressing, growing, Achieving, upgrading, helping, turning, protecting, exercising, services, going, featuring, performing, Looming, Affirming, Delivering, Providing, flowing, bearing, living, leading, Accomplishing, Securing, Placing, Aiming, reaching, watching, appearing, rising, Referring, Registering, working, challenges, assuring, Relating, type, Allowing, trying, Applying, happening, raging, studying, meeting, serving, Having, taking, starting, getting, according, shifting, binding, backing, survey, passing, ongoing, unceasing, unremitting, lingering, unfailing, continuous, unwavering, unflagging, long-standing, continuity, proceeding, abiding, untiring, running, Sustaining, unflinching, unstinting, Maintaining. Remained, Prosecuted, stopped, Sued, Stayed, Been, engaged, ensured, halted, Flowed, sustained, pursued. pursues, retains, stays, progresses, Carries, goes, allows, buys, ongoing, continuous. remove, persevere, ccontinue, sue, continuous. intermittent, periodical, recurrent, erratic, serial, outdated, antiquated, irregular, seasonal, sporadic, cyclic, obsolete, discontinuous, occasional, unsteady, out-of-date, noncontinuous, outmoded, alternating, fitful, outworn, short, dated, spasmodic, alternate, discontinued, periodic, spotty, passe, archaic, rhythmic. A gathering storm induced us to return, instead of continuing our progress on the lake. In the silence, the steady whisper of rain came to my ears again, continuing patiently. commanding, continuance, counting, contumacious, countinghouse, committedness, condense, condemning, Caucasus Mountains, continency, chain tongs, countenance, cantonese, chanting, conditioning, candidness, contumacy, continence, commuting, continuous, Canadian Goose.